What an opening for you! 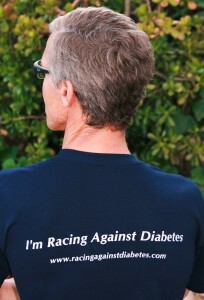 You get to tell them it’s right now, and they’re in it; do they know any diabetics, and will they join your team? “I’m Racing” shirts are also great reinforcement for your commitment to win the race–wear yours when you go to Hometown Buffet, and you won’t be able to pig out! HELP US BUY MORE T-SHIRTS TO GIVE AWAY! Contributions are good, so we can give away more T-shirts. We want everyone in the U.S. wearing one! We’ll send you back an acknowledgement for tax purposes—and our sincere thanks! —Because when you wear your “I’m RAD” T-shirt, you’re committed! You won’t let yourself be a couch potato when you wear it, and you’ll get support from everyone who sees it! Plus you’ll help get the message out—that we all need to start training to win the Race Against Diabetes!